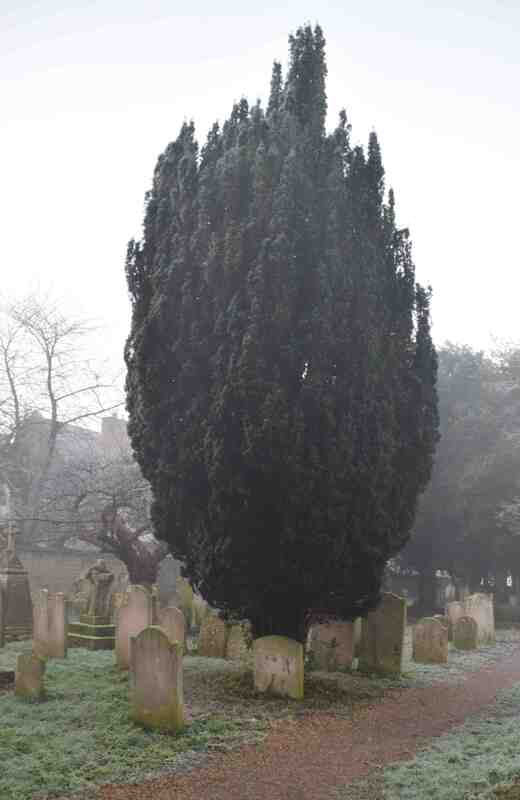 No tree is more associated with churchyards than the common yew (Taxus baccata) or has an appropriately sombre appearance. Fresh and upright when young, it becomes spreading with age, hung with pendant branches, spangled, on female plants, with red berries. 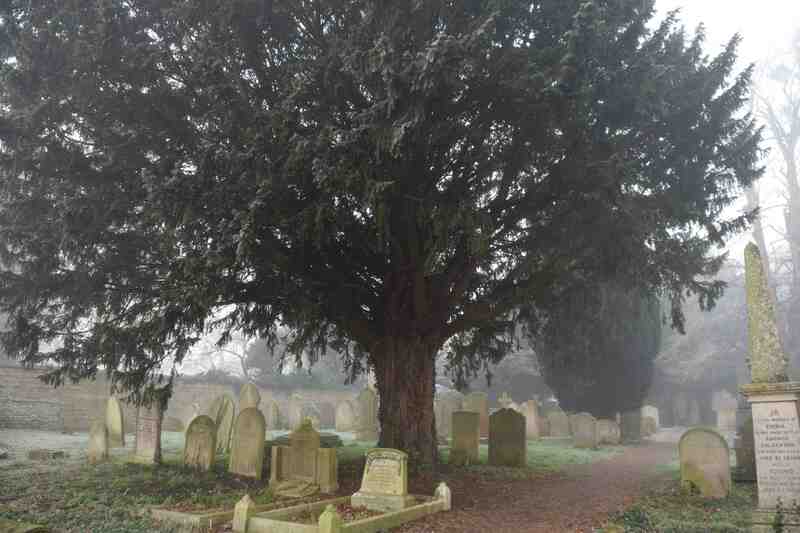 The churchyard connection dates back to before Christianity when pagan religions revered all evergreens, that seemed to be alive in the death of winter, and when Christians started to build their edifices they frequently chose existing ‘religious’ sites. The actual age of many ‘ancient’ yews is always up for debate but yews certainly have the potential to be the oldest trees in the landscape, living for a thousand years or more. Yews are native to the UK, Ireland and Europe and were widespread throughout the UK until they were extensively felled to use as bows. Yews are associated with the chalk downlands of the south of England, especially with beech (fagus) but it yews are found throughout the country. Trees are either male or female and males have abundant small cones that release masses of pollen in spring. Female trees produce single seeds partly covered by a fleshy coating. Although the seeds are poisonous, the red, fleshy part is not. It is widely known that yew foliage is poisonous to livestock but some disagreement about how poisonous and in what stage – fresh or dry. Better to be safe than sorry though. Because yew is tough, hardy, can grow on almost any soil, survives in sun or shade and can be pruned hard and recover, it makes a fine hedge and most stately homes and large gardens have ancient yew hedges. For domestic gardens it also makes a very good choice and is far better than most conifers or even privet and, although not fast-growing as a young plant it is not that slow either and should put on 30cm of growth a year. There are many forms of yew in cultivation and in Ireland I planted a row of the upright, golden cultivar called ‘David’ which is very slow and manageable, but the plain green, upright (fastigiate) yew is more commonly known as the Irish yew. The Irish yew was discovered prior to 1838 (when it was commercially available) in Co. Fermanagh. Apparently two similar plants were found and one died and it was from this one plant that all Irish yews originated. It is a female plant and has berries. When I lived in Newark we had a number of old yews. They seeded many smaller ones which I dug up and transplanted into a hedge. that is good use of them! my father in law Charlie shaped a yew tree into a big bird . the local paper took photos of him and big bird . so pleased to have those photos as the yew was dug up after house was sold . that’s a shame it was destroyed after all that work. Well done on having the photos!